A booming best arts town with cultural roots extending as far back as the Colonial era, Old Town Bluffton is a hidden gem among South Carolina coastal communities. Recently named in the Top 25 Small Cities for Art in American Style Magazine, Bluffton’s one-square mile National Historic District has a plethora of art galleries and antique stores embracing the artisan culture. The Society of Bluffton Artists showcases new work of over one-hundred professional and aspiring artists at the monthly exhibits. Resident are encouraged to discover their inner artist through numerous classes covering a wide array of art styles and techniques. Each month brings with it a new program filled with exciting learning possibilities lead by professional artists. For a more in depth look at the heritage of Bluffton and its artists, embark on the “Historic Bluffton Arts District Tour.” A mile and a half walk leads you through all the local galleries, introduces you to local artists, and gives a historical tour through Old Towne Bluffton. Gorgeous antebellum architecture lines the streets of Historic Downtown where much of the city’s cultural roots lie. Music lovers may want to attend the Metropolitan Opera held at the Historic Beaufort Campus Center For The Arts. The Ulmer Auditorium is another famous attraction for fans of the theater; hosted by the May River Theater. Keeping the mind active is just as important as keeping the body active, and the University of South Carolina Beaufort agrees. The university hosts the Osher Lifelong Learning Institute (OLLI), with a campus on Hilton Head Island. Over 400 courses at the Osher Lifelong Learning Institute are geared towards mature adults and cover a wide array of fields of study. Enrollment in OLLI courses also allow members to receive discount tickets to university performances at the Performing Arts Center at USCB in Beaufort, and to the Metropolitan Opera. South Carolina supports the furthering of education in its mature residents. Many state colleges offer programs and courses for seniors, and South Carolina’s law provides tuition exemption for its residents age 60 and up. The New River Campus in Bluffton also offers a collection of technical courses through The Technical College of the Low Country. Brush up on computer skills, or learn the essentials in digital photography. With average home prices in the $ 200k, Bluffton new homes are an affordable investment for Baby Boomers looking to downsize and for the resort-like amenities and stunning scenery. Real estate tax rates in Beaufort County were estimated at .0038 per $ 100, with the city’s rate at .0053 per $ 100 valuation. Hilton Head Island homes are estimated around $ 320k. The Bluffton, South Carolina coastal communities are an attractive place for Baby Boomers looking where to retire in South Carolina. Savannah Hilton Head Int’l Airport is approximately a forty minute drive from Downtown Bluffton. The nearby Hilton Head Island Airport is a quicker fifteen minute drive from Bluffton. The Airport is serviced by US Airways Express and offers 8 arriving flights from Charlotte, NC and 9 flights departing for Charlotte, NC as well as one Saturday flight to and from Washington, DC. Highway 278 passes directly through Bluffton and leads out to Interstate 95 where travelers can easily ride to other large cities including Savannah and Charleston. Homegrown vegetables taste that much more delicious at Bluffton Farmer’s Market. Every Thursdays locals head to the market for fresh fruits and vegetables in Downtown Bluffton. Farmers bring their organic produce along with homemade preserves. Another popular Farmer’s Market is the nearby Hilton Head Island Farmer’s Market at Shelter Cove. They have everything from homemade dog treats, to fresh baked goods and morning crepes. The Hilton Head Island Farmer’s Market is held every Wednesday from May until October. Many restaurants in downtown are vegan and vegetarian friendly, offering alternative menus. Bluffton also boasts an organic food store located near Sheridan Park. Circle of Health has a delicious juice bar cafe, and sells a collection of specialty products in-store. A celebration of the Gullah culture through food, stories, art, and livemusic. The annual Hilton Head Island Wine & Food Festival has become one of the East Coast’s largest wine festivals and international wine competition. Join in on the fun through wine tasting, delicious dinners, and silent auctions. The competition showcases young artists’ talent in front of internationally acclaimed judges. The event is hosted by the First Presbyterian Church. The RBC Heritage PGA Golf Tournament passes through Hilton Head Island this year. The annual fine arts and crafts show is hosted by the Coastal Discovery Museum which. Artists compete for prizes during the week-long event. Browse the local art for sale at this annual event. The Bluffton Village Festival brings out the best of Bluffton with pie eating contests, live music, and arts and crafts. The community comes together during this event; with local vendors showcasing their very best products. The HarbourFest at Shelter Cove Harbour has it all. Fireworks, clowns, live music, art, dolphin boat cruise, and kids activities. Fun for the whole family! ‘Where Fine Art & the Bounty of the Sea Come Together.’ Held in the Historic Downtown of Bluffton, this event includes art shows, caterers, and top-knotch entertainment. Browse through art tents lined up on the streets as you taste authentic Southern cuisine. The festival includes multiple competitions and a 5K Fun Run. A car show unlike any other. The country’s finest collector automobiles come together under one roof. From wooden boats to two-wheeled machines and beach mobiles, this event highlights machinery at its best. Bluffton SC – BeerFest, Nov. This event features an international array of Great Breweries: Belgium, Germany, Netherlands and American Craft Breweries. Over 190 unique ales combined with good music and great food make this event a success every year. The event also donated a portion of the proceeds to the Palmetto Animal League, a local animal rescue organization. Bluffton SC, founded in 1852, is not only known for its cultural roots preceding the Civil War, but also for its stunning preserved beauty. 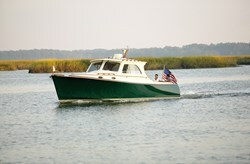 The May River passes along the Old Town District; inviting fishers and boaters to enjoy in riverside pastimes. The Bluffton area is said have been wetlands before it was drained in the antebellum era. The lush vegetation that surrounds Bluffton gives a majestic feel to Historic Downtown with drooping willows and old oaks. Bluffton new homes are built in master planned communities and add to the gorgeous setting of the wetlands. Bluffton’s rich history is embodied in the town’s old architecture, numerous cultural events, and historic landmarks. Despite the town’s record growth, Bluffton is still referred to as ‘The Last True Coastal Village of the South.’ The town’s warm hospitality and dedication to preservation, allows Old Town Bluffton to retain its small town charm. The Bluffton Historical Preservation Society monitors preservation, restoration, and gives guided tours through historical monuments. Bluffton’s collection of master planned communities offer something for everyone. Bluffton new homes provide everything from four-star dining options to world-class golf courses. Colleton River Plantation, Belfair, and Berkeley Hall are known as the top golf communities. The Colleton River Plantation is a gated community bordering the Colleton and Chechessee Rivers. Its gorgeous scenery is mastered by a Pete Dye 18 Hole Championship Golf Course specked with giant oaks, and topped with the Pete Dye Golf Clubhouse. Just down the river is Belfair, boasting its prime Lowcountry real estate. This gated Bluffton community offers not only Two 18 Hole Championship Golf Courses designed by Tom Fazio, but also a 29 Acre Golf Practice Facility and Jim Ferree Learning Center. This is enough to win any golf enthusiast’s heart. Berkeley Hall is just as beautiful, named One of America’s 100 Premier Properties by Travel & Leisure Golf. This beautiful community also attracts golfers with its Two 18 Hole Tom Fazio ‘Core Golf Courses’. Outdoor adventurers enjoy the 10 Mile Greenway Trails that encompass the community. Palmetto Bluff and Oldfield Club are tied for the best comprehensive neighborhoods with amenities provided a la carte. This ‘pay when you play’ mentality allows residents to feel in control of their schedule. Whether residents spend the day hiking at the 6,000 Acre Nature Preserve or prefer to hit a hole in one at the champion golf course, members choose where their time and money goes. The Beaufort Memorial hospital is the first and only South Carolina hospital to be awarded the coveted Pathway to Excellence designation by the American Nurses Credentialing Center. Known as an innovative hospital, Beaufort Memorial keeps up to date on new technologies; using the high-end da Vinci surgical system, and offering the fastest results with their consolidated diagnostic technology. A twenty minute drive from Bluffton, this acute care facility offers quality care. Some of the hospital’s medical services include Center for Hyperbarics & Wound Healing, Emergency Services, Imaging/Diagnostic Services, and Surgical Services. The hospital recently announced their plan for a New Women’s Unit, and also earned itself a Top Performer on Key Quality Measures recognition by The Joint Commission. Bluffton’s subtropical climate is a top 10 reason of why and where to retire in South Carolina. This beautiful town offers four mild seasons, incredible lakefront beauty, intriguing art, rich culture, quick access to major cities and home affordability. This entry was posted in Restaurants and tagged Bluffton, Carolina, Festivities, glimpse, Holiday, into, Provide, Reasons, retire, South on December 8, 2013 by David. This entry was posted in Museums and tagged Career, glimpse, Long, show on August 7, 2013 by David.